With regards to the Real Techniques brushes, I feel as though I have little to say about them, as it's all been said before. They're fantastic brushes at a reasonable price, which last well and look attractive. Soap & Glory's Archery Brow Tint & Precision Shaping Pencil first came to my attention via Zoella on YouTube, so off I went and purchased it. I found it just a tad too dark, but used it until it was all dried up and gone anyway. I went back to Boots to repurchase it, got it home, and what's that? It's a different colour? Yes. Apparently this comes in more than one shade! I'm so happy I made this little discovery, as I find the second shade I bought (Love is Blonde) suits me perfectly for a natural look, whereas the first (Brownie Points) works better if I want my brows to stand out a little more. One end is a fine felt tip, and the other is a thin retractable waxy pencil. I prefer using the felt tip end, but I find the waxy-pencil useful for keeping them in place. Another product from Soap & Glory - Thick & Fast High-Definition Collagen-Coat Mascara. Honestly? I love this more than Benefit's They're Real - and that's saying something. I've stayed loyal to L'Oreal's SuperLiner for many years now, I must have repurchased it at least 10 times?! The colour is deep, the staying power is excellent, and the application & removal - not a problem. They also do one in the colour 'Black Vinyl' which is SO easy to remove, it literally peels off in one go. (Only when you want it to!) Brilliant for really crisp lines - not a single smudge in sight. Revlon's Nearly Naked foundation is something that I'd been meaning to try for a long long time. I finally have, and we're getting on well. A nice lightweight base with good staying power and a perfect match for my skin. Less 'glowy' than Bourjois Healthy Mix too, so it's a win for my oily skin. It was hard to let go of my beloved Collection concealer, but I thought I'd give Seventeen 18 Hour Stay Time a go instead. Whilst I believe it has less coverage than the Collection one, I do actually quite like it. Now that I've waved goodbye to my acne, coverage isn't so important to me anymore. Non-cakey, pale enough and cheap - yes please. I bought the Clinique Chubby Stick Intense in Curviest Caramel a couple of months ago now, and never have I stayed so loyal to a lip product in my life. The colour looks so natural, and I'd say I reach for this almost every single day. Love it! 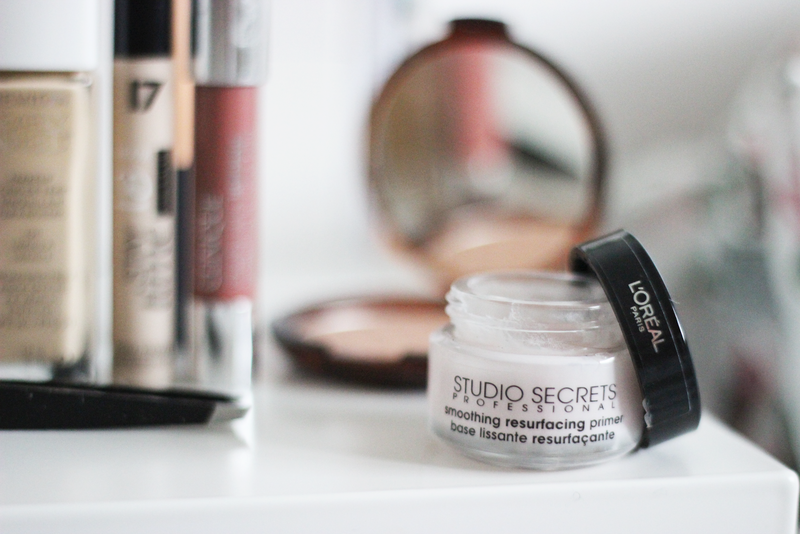 This lovely little pot of stuff (L'Oreal Paris Studio Secrets Smoothing Resurfacing Primer) featured on my blog last September, back when all of my blog photos were taken with my phone... and some managed to turn a little green..(?) You can read the review HERE. It's safe to say I still love this stuff, but have dabbled with other primers since then. Whilst it is a great primer, I don't feel as though it is a good value for money, as the pot is very small - although I do believe it has come down in price since then. This primer just *works*. It knows what it's supposed to do, and it does it. Well. 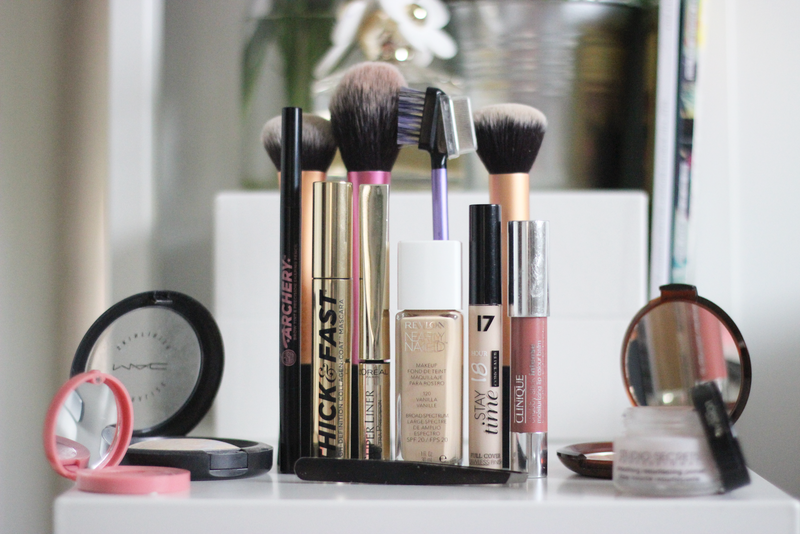 Having just complained about the size, it's actually quite handy as it hardly takes up any room in my makeup bag. And of course MAC's MSF in Lightscapade would make an appearance. 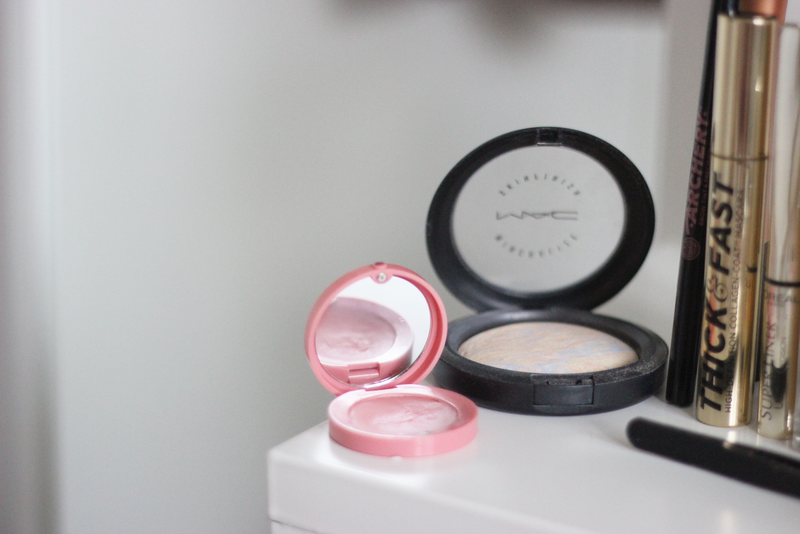 It's the most perfect highlighting powder ever. Pretty enough to brighten up your cheeks, and not too overpowering to exclude it from 'all-over' use for a really healthy looking glow. I'm completely in love with this. 100%. Next up is my current blush of choice, Bourjois Cream Blush in Shade 03 - Rose Tender. I am so desperate to try the other colours in this range, as I absolutely love the formula, but I am craving a different tone on my cheeks, and maybe looking to step away from the ever-so-slight shimmer that this shade offers. And finally, the gorgeous 'Honey Bronzer' from The Body Shop (£13), which I mentioned in my last video. It's perfect for pale-skinned gals like myself, and the honeycomb pattern is just too pretty to resist! I've never been much of a bronzer person before, but things have changed thanks to this little gem. Such a great selection of products! Plus your makeup bag is lovely! I will have to check out that bronzer, I am also blessed with super pale skin! That bag is super nice Amy, I never see nice little bags like that. I use the same concealer I find that I much prefer it to the Collection one that everybody talks about and the same goes for the Revlon Nearly Naked foundation of which I too use Vanilla. It's such a nice foundation and is one that I need to re-buy, however I have noticed that I need larger Boots to find this shade as the small ones by me never have it ranged. love the selection of products i have the masacara and i love it , but the other things you have look just as good and the bag is so cute too. I never get tired of these kinds of posts, it's so fun seeing what others love! Great stuff. I've been meaning to try the Honey Bronzer for such a long time. I almost bought it during the 40% off sale on the body shop website. But I have so many bronzers and not enough face. I also really like real techniques. I recently bought the Sam's Picks set and I love nearly all the brushes in there. 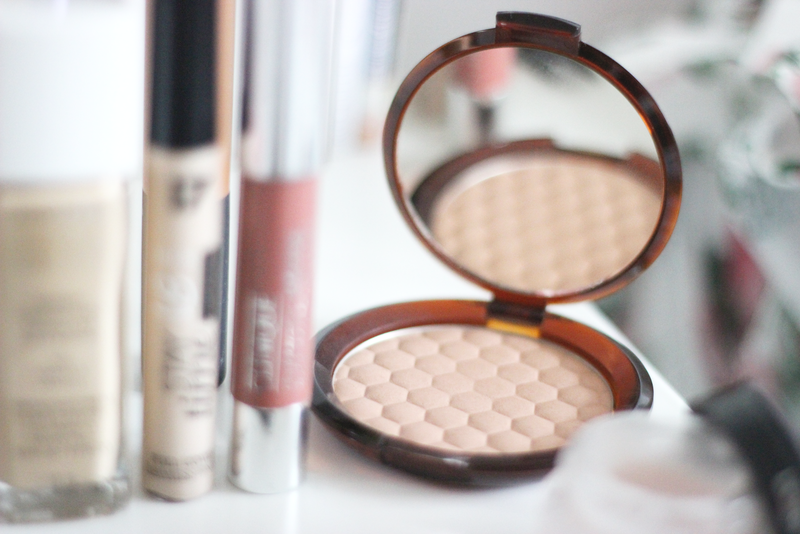 The Honey Bronzer really is lovely, but you're correct - you can only have so many bronzers! I feel the same way about blushers at the moment! The bodyshop bronzer is amazing !!! I love this post! 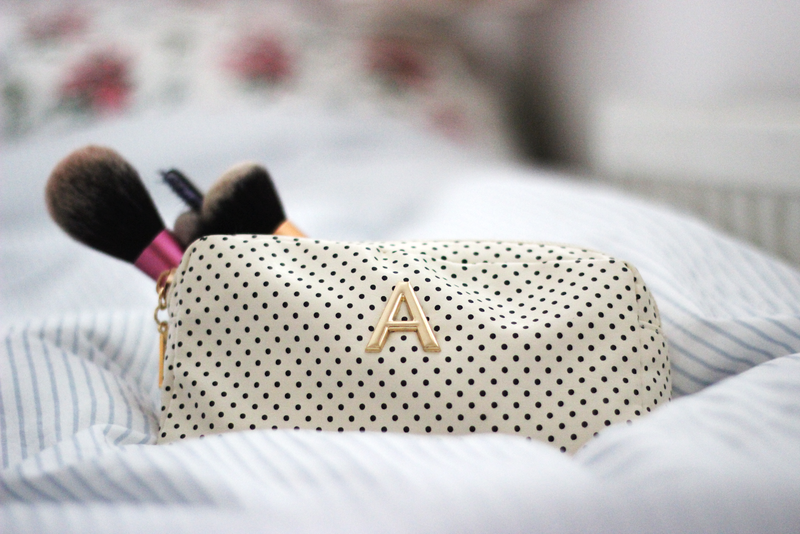 Your makeup bag is beautiful!